New Jersey is a leader in smart growth. In recent years, the nation’s most densely populated state has made considerable progress in ensuring that it grows in places that are suited for development, while preserving its remaining open spaces. Annually the Garden State has preserved more than three times the amount of land than it developed; newly-developed acres grew 1.3 times as fast as population between 1995 and 2002, down from 2.3 times as fast between 1986 and 1995; and three of the state’s four largest cities have gained population since 2000. New Jersey Future’s annual Smart Growth Awards highlight this type of development, and capture the energy that is transforming places around the state. Since 2002, New Jersey Future has honored 46 development and redevelopment projects and plans—diverse in project type, size and location—that exemplify the best of smart growth in New Jersey. The majority of winners have been downtown and neighborhood revitalization projects (14) and vision/redevelopment plans (13). Others have included housing and community support projects (11), educational facilities (3) and arts centers (2). On June 5, seven projects will receive Smart Growth Awards from New Jersey Future at a reception at the Newark Club. The Heldrich Redevelopment Project in New Brunswick and Park Square in Rahway provide mixed-use, transit-friendly downtown developments that help bring new activity to established downtowns. The Plainsboro Village Center and the Rahway Town Center Master Plan aim to create town centers in either new or established contexts in order to create new focal points for the community and region. Two honorees add to the housing stock in unique ways: The Abbett Avenue Apartments in Morristown will provide high-quality affordable housing with supportive social services in walking distance of the downtown area. Eleven80 in Newark turns a decaying downtown art deco office tower into luxury rental apartments. The Health Sciences Campus in Camden rebuilds and expands major health care facilities, revitalizes an adjacent historic neighborhood, restores Camden’s traditional shopping street and improves access to public transportation. 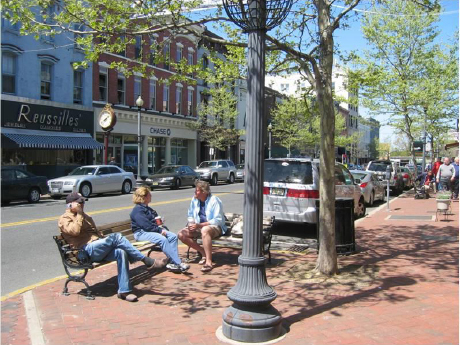 New Jersey Future, the state’s leading smart-growth research and advocacy group, strives to make the Garden State more livable and sustainable. We advocate for development in places well suited for growth while discouraging it in places that should be preserved. One of the best ways to achieve this is to build strong, dense, mixed-use communities near transit and existing infrastructure that offer a unique sense of place and non-vehicular ways to get around, thus taking growth pressure off of our remaining open spaces and natural resources. The Smart Growth Awards highlight successes on the ground. These successes are especially inspiring given the series of obstacles—real or perceived—that are often associated with growth and development in New Jersey: municipal zoning that encourages sprawl, absence of regional planning, reluctance to invest in urban areas, aversion to density, skepticism about the reuse of buildings, to name just a few. The Smart Growth Award-winners demonstrate that New Jersey is a place where leadership and cooperation, imagination and perseverance, a flexible regulatory review and smart investment by public and private sources can actually succeed in making our state a better place for people to live and work. It is in the state’s interest to promote smart growth projects like those honored this year, and to overcome potential hurdles to sensible development. Winners are selected from a statewide public nomination process by an independent jury of professional developers, architects, planners and redevelopment experts. To view detailed descriptions of this year’s and previous winners, to obtain additional information about the June 5 Smart Growth Awards Celebration, or to register, please visit our website. If you have any questions about this issue of Future Facts, Teri Jover, Managing Director.